Mac users who rely on AEC Software’s FastTrack Schedule to get a handle on project management have gone nearly four years without a major upgrade to the venerable program. Version 9 of the project management software arrived in 2006. And while AEC has kept its flagship product updated, the company will be the first to concede that major revamps have been few and far between. “It’s been a little bit too long since we’ve had a new version,” AEC vice president of marketing Ryan Kish told Macworld. AEC hopes to be Exhibit A for the old adage that good things come to those who wait. 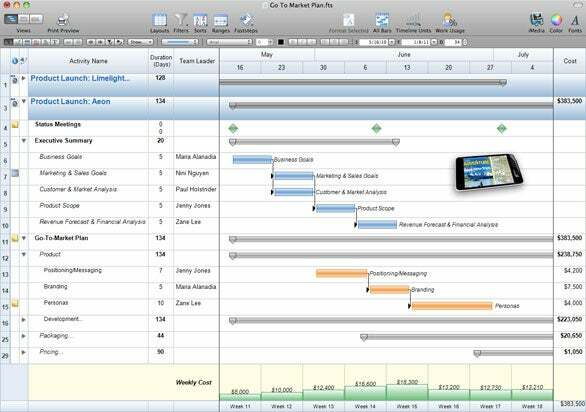 The company has unveiled FastTrack Schedule 10, a major overhaul that makes the project management application look more Mac-like than ever before. Among Mac-using project managers, FastTrack Schedule had won raves for its scheduling and resource allocation capabilities—so much so that many of those users were willing to overlook an interface that seemed out of place on the Mac platform. FastTrack “has always had the same look on Mac and Windows,” Kish said. “And in many ways, that was appreciated by our customers”—particularly those who worked in cross-platform environments and moved back and forth between the Mac and Windows version of the product. FastTrack Schedule 10, however, fully embraces the Mac look. The goal, AEC says, is a more intuitive interface that gives users easy access to tools for planning and tracking projects. In fact, AEC openly points to Apple’s iWork suite as an inspiration for FastTrack’s new look, and it’s easy to spot the similarities. A context-sensitive Format Bar gives users access to scheduling tools. The application’s toolbar is customizable, and icons help users switch between schedule, calendar, and resource views. New to the toolbar, an iMedia browser makes it easy to add pictures and logos to schedules. 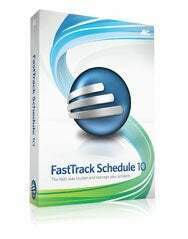 FastTrack Schedule 10 may have a more Mac-like look for OS X users, but AEC also put a focus on maintaining cross-platform compatibility with the Windows version of the project management program. The company also considered compatibility with other products. Kish says FastTrack will seamlessly open up Microsoft Project files, and the application continues to offer integration with Mindjet’s MindManager brainstorming tool. That integration, first introduced a few years ago, lets FastTrack users open MindManager files and turn them into projects; they can also save projects into MindManager. Those aren’t the only features slated for FastTrack Schedule 10. In what Kish called the single most requested feature from users, the new version adds effort-driven scheduling. That allows users to adjust how long a task lasts as they add or subtract resources while keeping the total work constant. Users can also apply fixed duration for tasks that require a specific amount of time to complete. The new version of FastTrack adds assignment contouring, a feature that saves project managers from having to apply the same amount of work over the duration of a task. Instead, they can chose eight built-in contours—or customize one of their own—for more flexibility in scheduling and re-distributing resources. Other resource-management tools in version 10 include a Work Usage Inspector for managing employee workloads and a redesigned resource information form where users can organize work schedules, rates, contact information, and even photos of workers. Another resource-management feature, resource usage graphing, offers a detailed look at a resource’s schedule for more precise assignments. FastTrack Schedule 10 also boasts calendaring enhancements. The application features integrated project, task, base, and resource work calendar systems for scheduling tasks and allocating resources. Users can apply exceptions to calendars for holidays or variable work schedules. And FastTrack unifies work calendars across all projects so that everyone’s working off the same calendar, even if they’re based in far-flung locales. New image columns in FastTrack let users add pictures of task items, resources, progress photos, and other visual aids into column cells—those images scale as thumbnails to match the heights of rows. Version 10 also offers new bar styles and gradients, as well as a Getting Started screen that gives users quick access to tutorials and videos. FastTrack Schedule 10 costs $349 for a new license; upgrade pricing starts at $179. AEC says it’s extending upgrade pricing to licensed users of FastTrack Schedule 7 and earlier for a limited time. The update runs on OS X 10.5 and 10.6.